I picked up a brand new 2011 Fiesta 5-door hatchback SE from Ford today for an 8-day test drive. I recently drove their new Taurus for a couple of weeks, but the Taurus is both out of my price range and too big for my tiny driveway. The Fiesta is a car I'd actually consider purchasing. 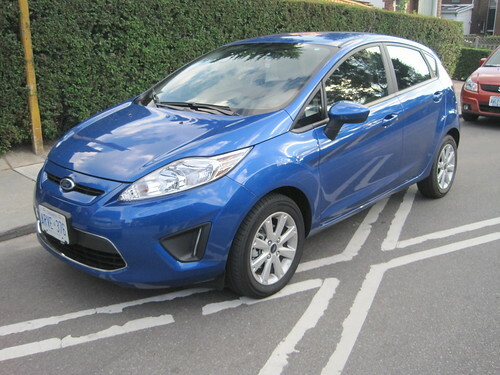 There's a little bit of a shock going from the mighty Taurus to the fuel-efficient Fiesta. All the Fiesta marketing materials scream aloud about their "class-leading" 4.9L/100 km highway and 6.8L/100 km city fuel consumption rating. It doesn't have the raw power and pep of the Taurus, but it's fun to drive. A lot of fun. I'm just glad I didn't take the Fiesta camping. I don't think it would have held my cooler, tent, sleeping bags and other gear. 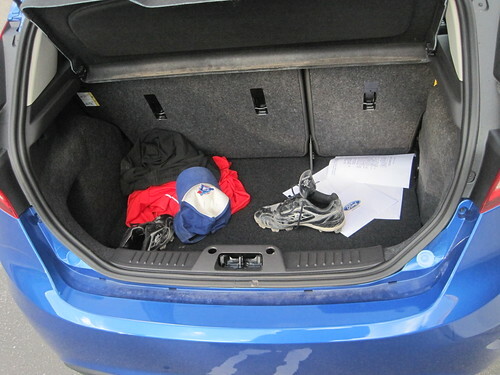 I mean, it was bigger than the Smart Fortwo I test drove last summer, but take a look at the trunk with just a little of my baseball gear inside. But when you go with a small, fuel-efficient car, you sacrifice space. The car I'm driving has a sticker price of $16799 with $2730 of extras. It's going to be a fun week. Hey! An old Jays hat from when they were good! Bring back the old logo. It might help bring back the crowds. If you like small cars Mike, you should love this one. The design is excellent, both on the exterior and interior. 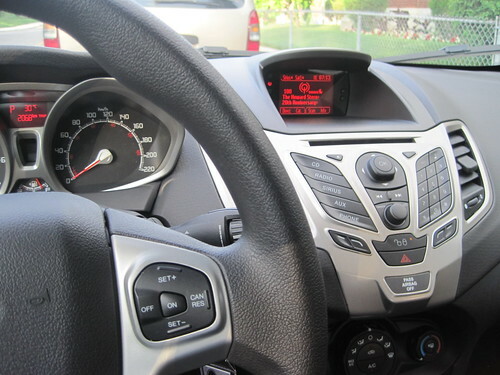 You should monitor the fuel consumption to see if it matches the claims.